Slimline cardboard case . 1 large size sticky note pad. 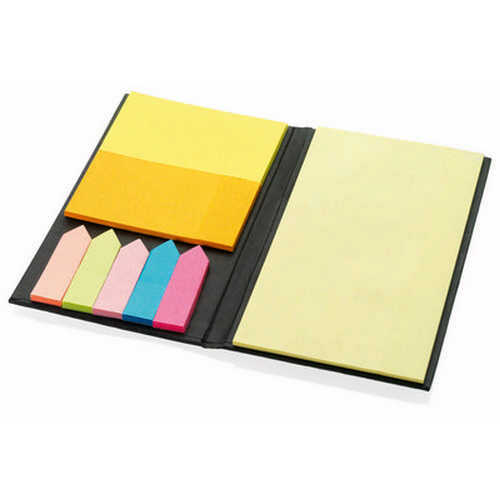 2 medium size coloured sticky note pads. 5 sticky flags. Product Size: 85 x 130 x 10mm. Product Packing: Bulk packed. Decoration Size: 60 x 30mm. Decoration Position: Front cover. Decoration Method: Pad Print. Carton Quantities: 100. Carton Size: 28.5 x 21 x 29. Carton Weight: 7. Colour: Black. Price includes : Pad Print 1 Colour / 1 Position. Setup is included.